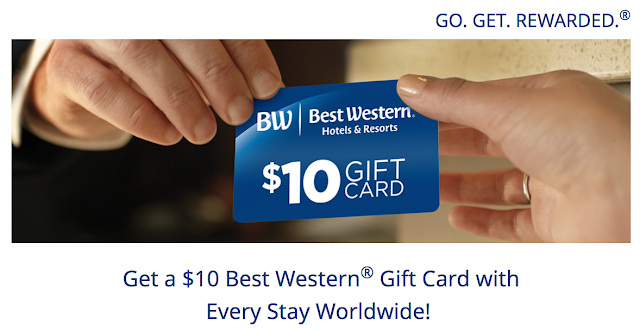 Best Western Rewards next systemwide promotion is the return of the $10 Best Western Gift Card with every BW stay. Last seen from November of last year all the way until April of this year the newest iteration will run from Dec 1 to Jan 31, 18. It's not a bad deal considering there are lots of BW hotels that can be booked for under $100 meaning you can pull a 10% or higher return. Now you only have 120 days to use up that gift card after it being issued so not a lot of time to make use of it especially if you don't stay at Best Western very often. The major difference this time versus last year's is that the promotion is open to all Best Western Rewards members worldwide instead of just North America. Also it does state The Gift Card will be issued in the member’s local currency, so does that mean someone in Canada will get a C$10 or will it be US$10 converted to about C$13?